I don’t think there’s anyone who doesn’t like to receive a prettily wrapped gift. And for me, there’s nothing more fun than watching everyone open their gifts on Christmas morning. But then afterwards, there’s always a garbage bag full of gift wrap that needs to be thrown away, most of which can’t be recycled. Over the past several years, I’ve had an ongoing project to make reusable fabric gift bags and furoshiki. What are furoshikI? They are a type of traditional Japanese wrapping cloth and are used to transport clothes, gifts and other items. 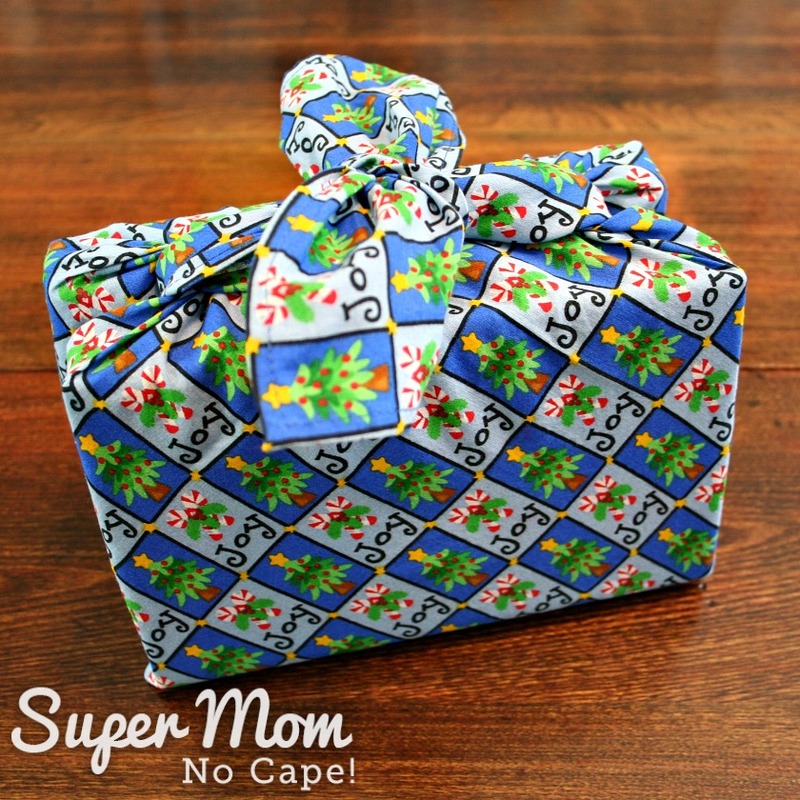 Cut a square or rectangle of fabric, hem it and then use it to wrap your gifts. 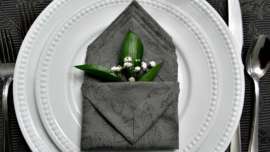 In fact, if the gift is for someone who sews, you wouldn’t even need to hem it as the fabric will become part of the gift. 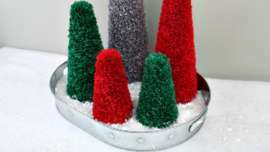 Though in that case, I would cut it out using a pinking sheers to keep the edges from fraying.. 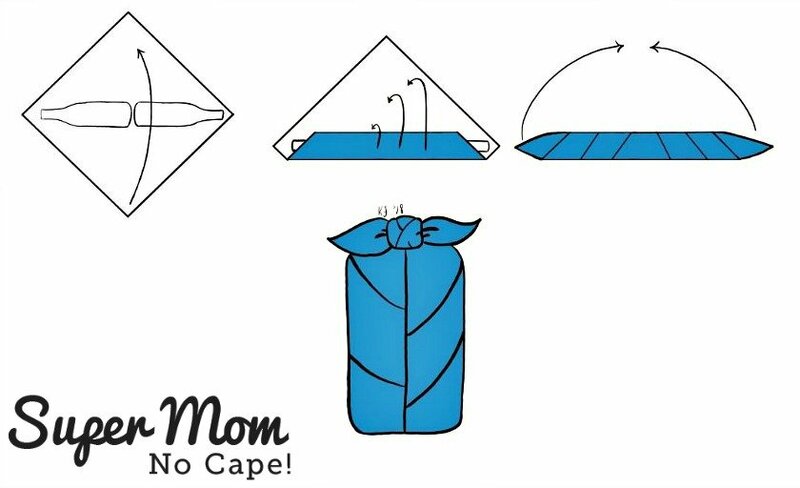 There are all sorts of different furoshiki wrapping methods. I’m going to share three of them with you today. First I want to thank our oldest daughter for creating the graphics for today’s post. I love them! Using those graphics, I’m going to demonstrate three furoshiki wrapping techniques. First, we’ll be wrapping a box. 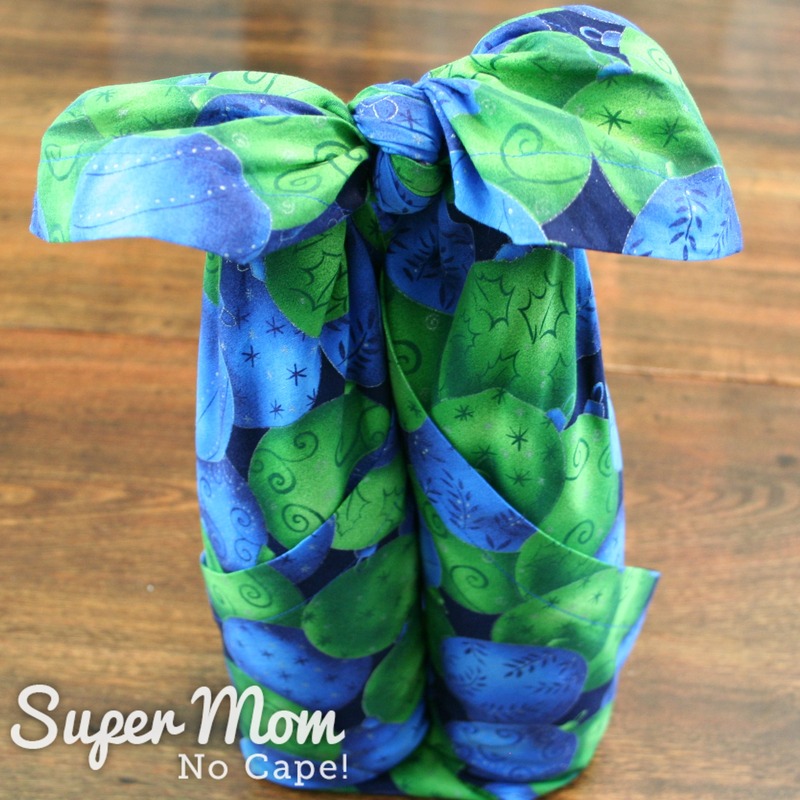 Then I’ll show you how to wrap two wine bottles. Since both Christmas and New Years are coming up, you might like to take your party host or hostess two bottles of wine. I’m sure they’d appreciate such a generous gift. 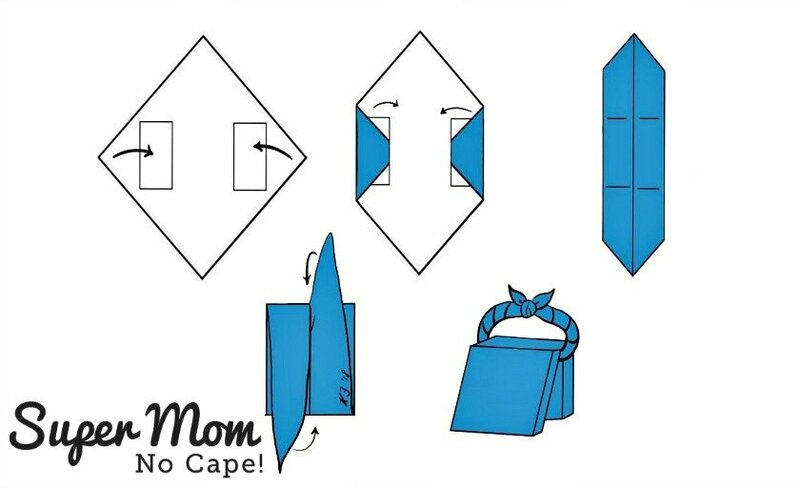 And because our family all loves to read, there’s a super cute way to wrap two books in one neat little package. Place the furoshiki right side down on a flat surface. Add the box to be wrapped to the center of the fabric. 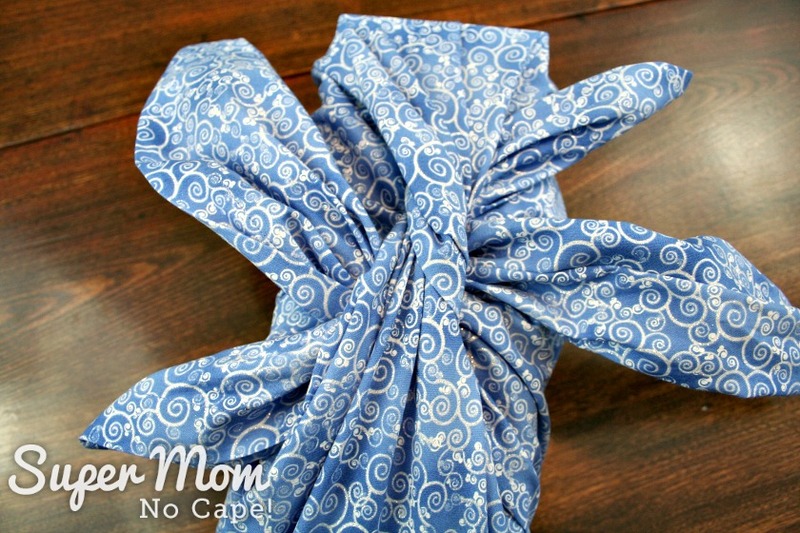 Draw up two opposite ends of the furoshiki and tie a half knot. Bring the other two ends under the half knot. Use those ends to tie a knot around the half knot. 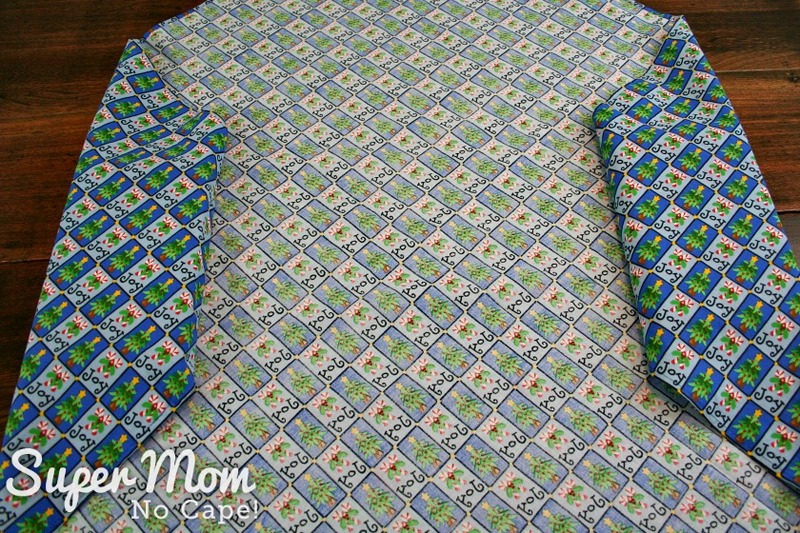 Place the bottles end to end on the fabric about 3 to 4 inches apart. Fold one point over the bottles as shown below. 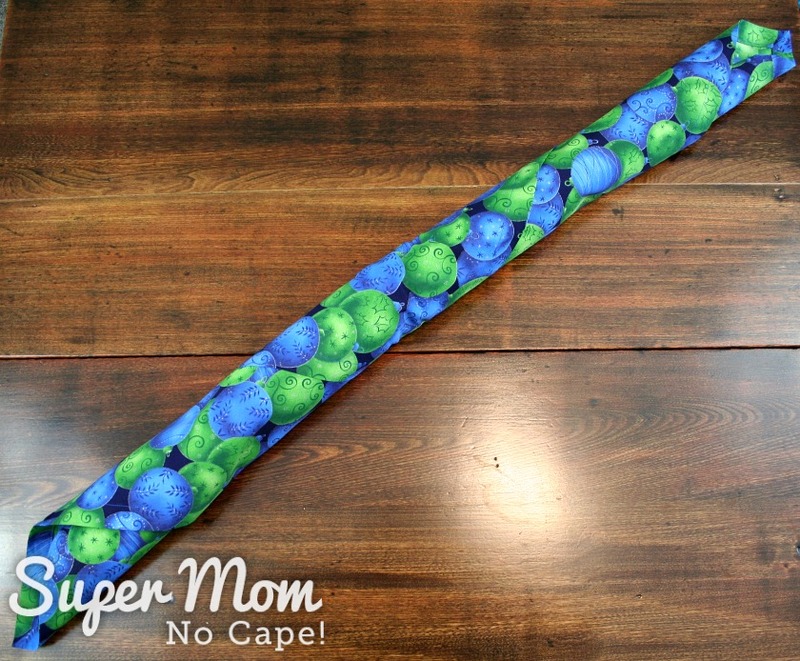 Roll the bottles to form a fabric tube. Make sure to have the end point facing up before performing the next step… that way the end gets trapped and held securely between the two bottles. Lift the bottles so that they are sitting upright. Tie a knot in the two ends. This holds the bottles together and also provides a carrying handle. Place one book close to the corner of the furoshiki. Then place the other book on the opposite corner. Tuck the corners underneath the books. Then roll the books towards the center of the fabric. Draw the ends over the books in the opposite direction. Draw those ends into the space between the books, flip the books over and tie a knot. 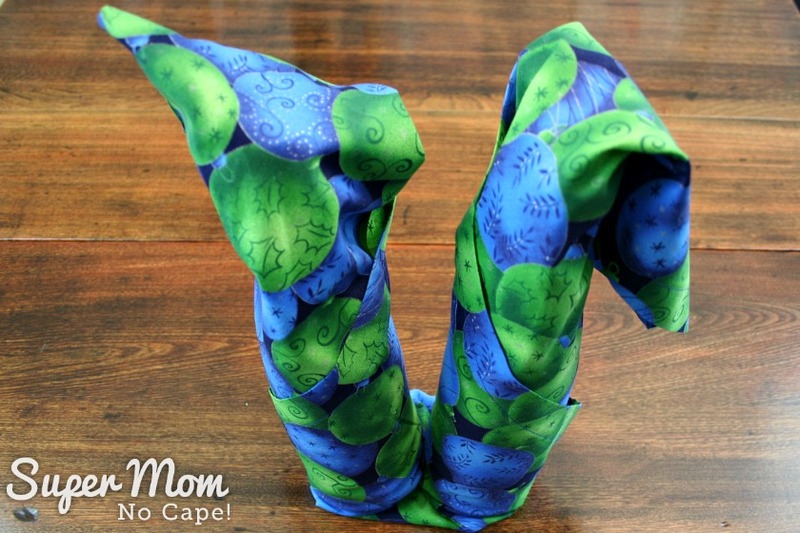 Isn’t that just the coolest way to wrap a pair of books! 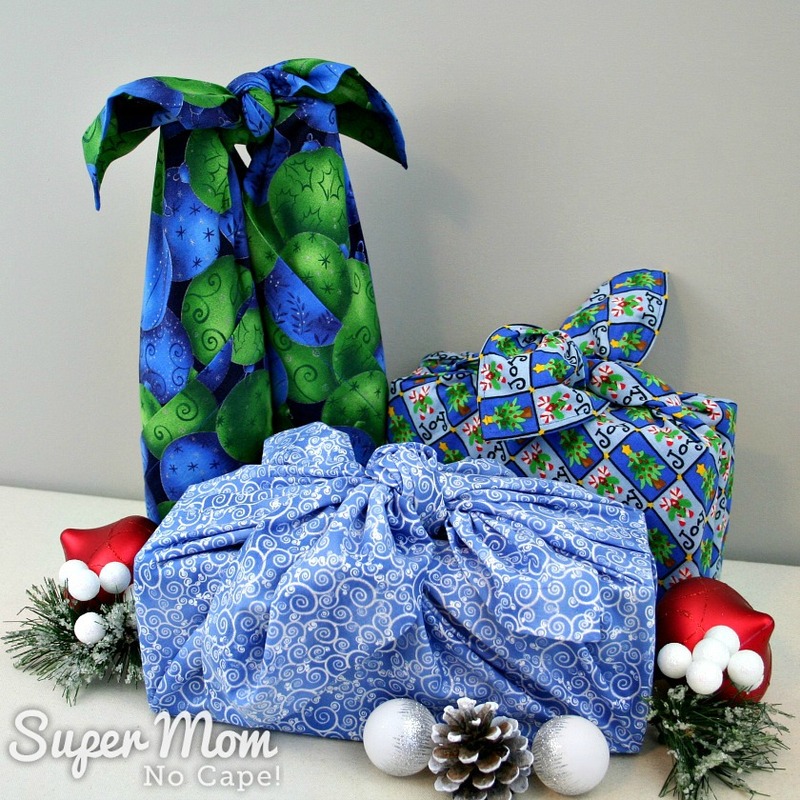 These three Christmas Furoshiki wrapped gifts are ready to pop under the tree or take to give to friends and family. 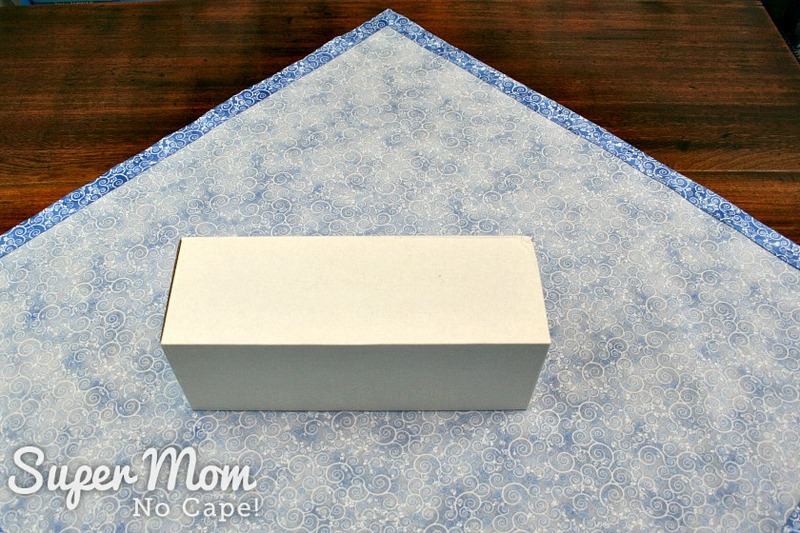 The blue fabric with the silver swirls used to wrap the box was 33″ square. 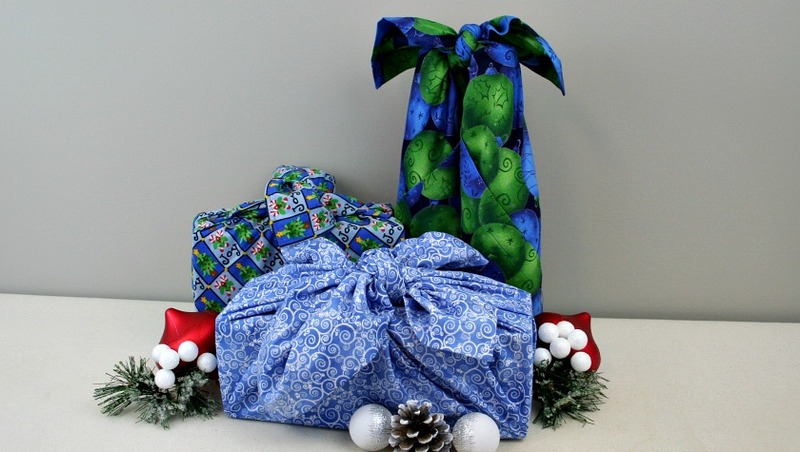 The green and blue Christmas baubles fabric that wrapped the wine bottles was 40″ square. 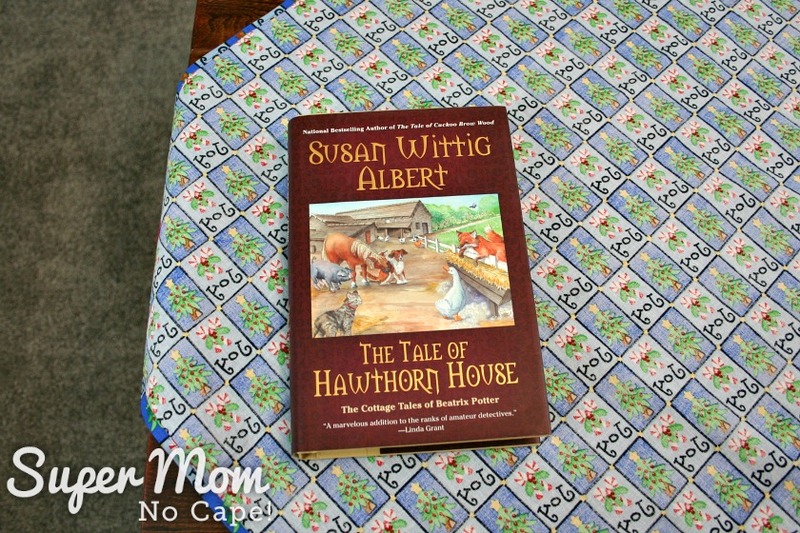 And the joy fabric to wrap the books was 36″ square. 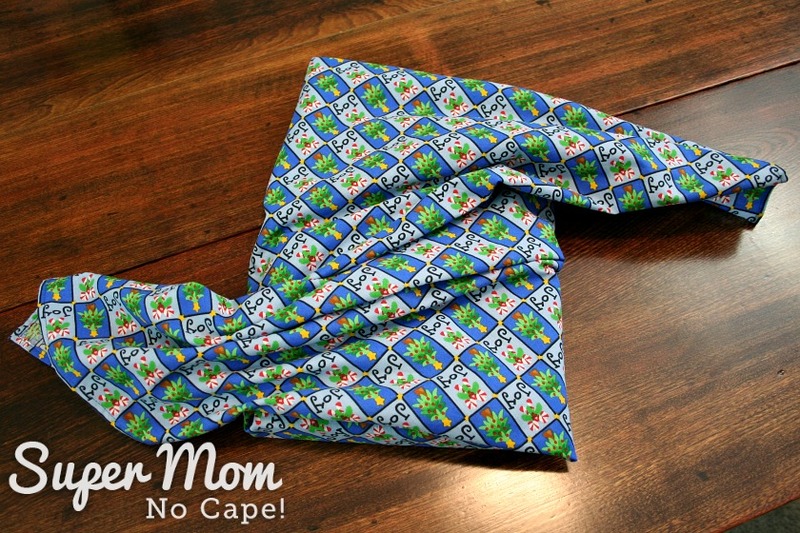 Several more furoshiki wrapping methods can be found on the One Million Women blog. 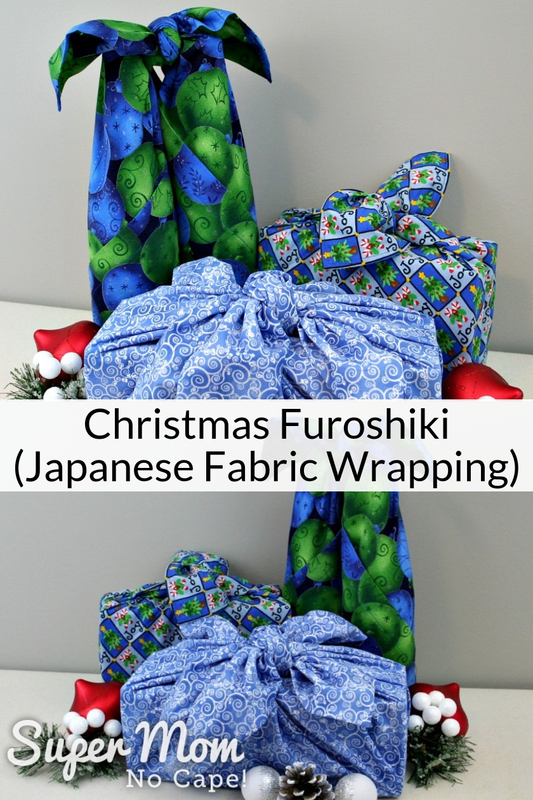 I hope you’ll wrap some of your gifts in Christmas Furoshiki this year. They’re something that can be used year after year and passed around within your circle of family and friends. 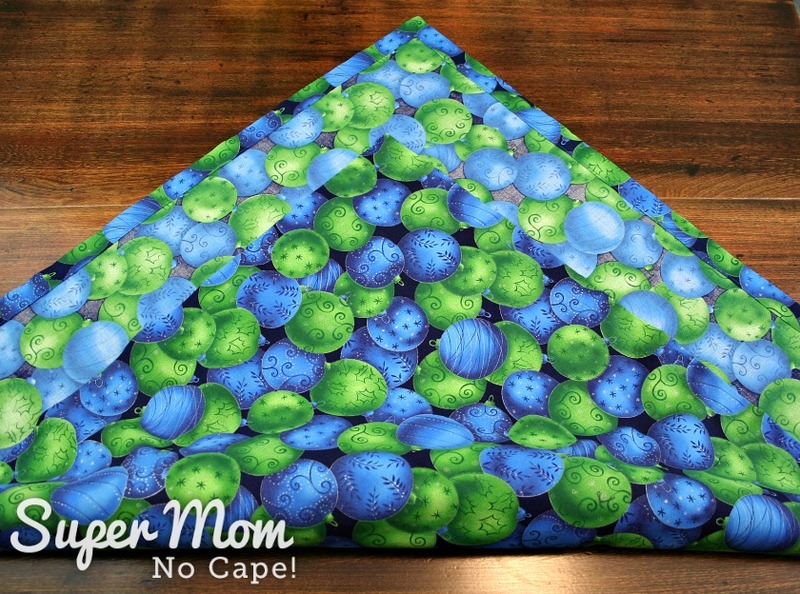 Over time, you’ll build up a good selection of different prints of fabric and sizes for wrapping all sorts of gifts. 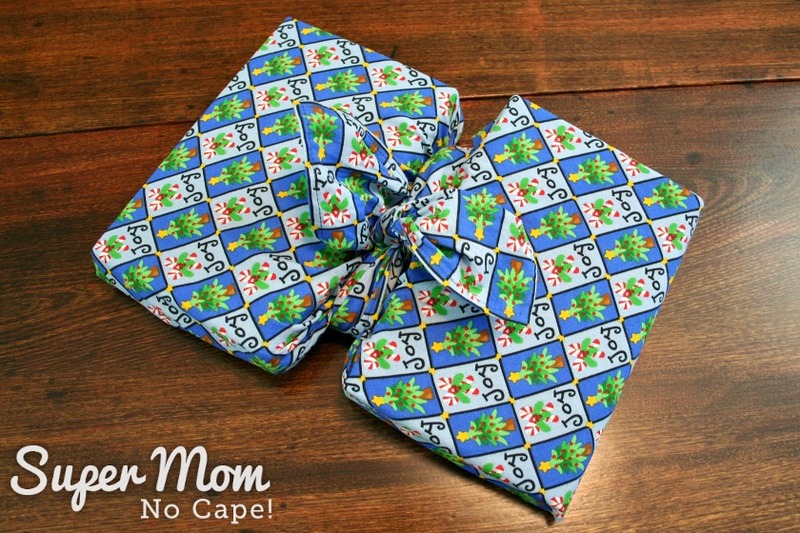 If you do decided to wrap gifts in this traditional Japanese fabric wrapping, please do post about it somewhere online and tag me so I can come see. 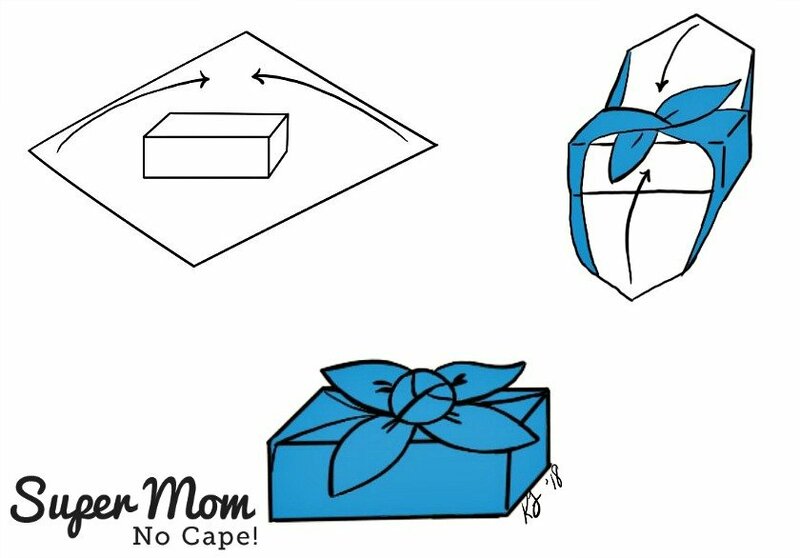 I’m @supermomnocape on Instragram, @1SuperMomNoCape on Twitter and @1SuperMomNoCape on Facebook. 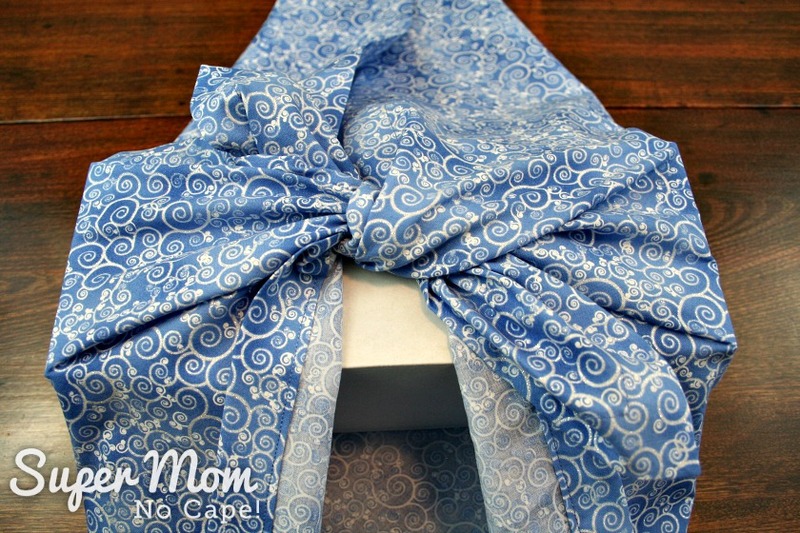 These are the pretty Drawstring Gift Bags with Divider that I made during the Sew Early for Christmas Blog Hop in July. Pam from Threading My Way provided the tutorial for those. 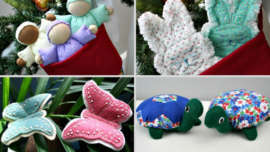 In my post, I provide some helpful hints for making them and also lots of ideas for gifts you can fill the bags with. 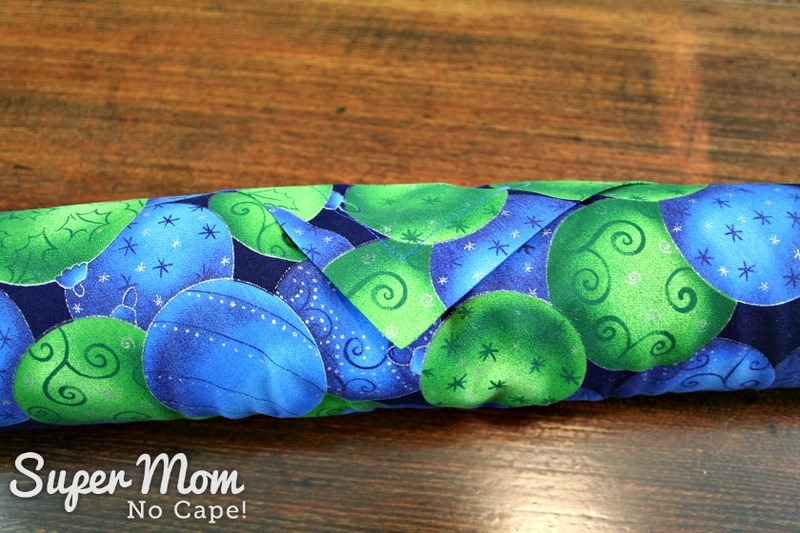 Be sure to save these Christmas Furoshiki by clicking on the Pinterest button underneath this post. 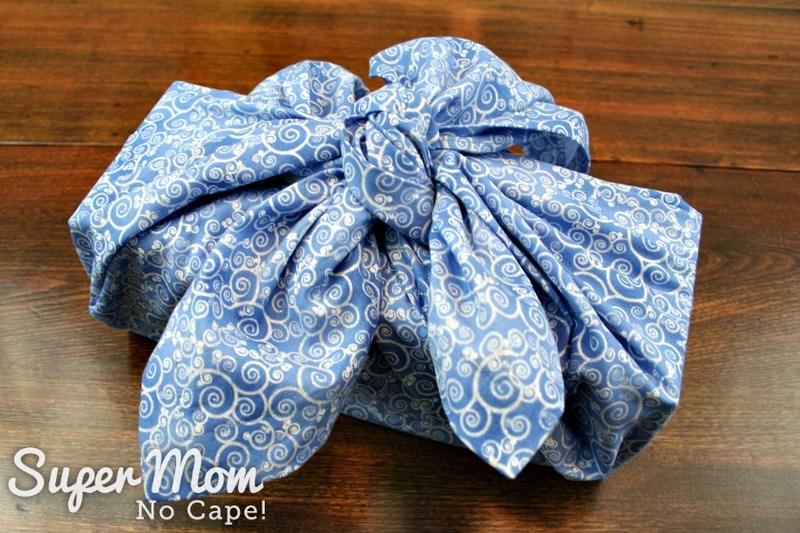 Thank you so much for the tutorials on how to wrap gifts with fabric! I’m all thumbs when it comes to making them look pretty but you make it look so easy. This is such a great way to reduce paper waste! The gifts look lovely and your tutorial is great. Thank you so much Beverly, what a nice compliment. Hey Sue, was your fabric about a yard square. Just wondering a good starting point. Sorry it took so long to get back to you! 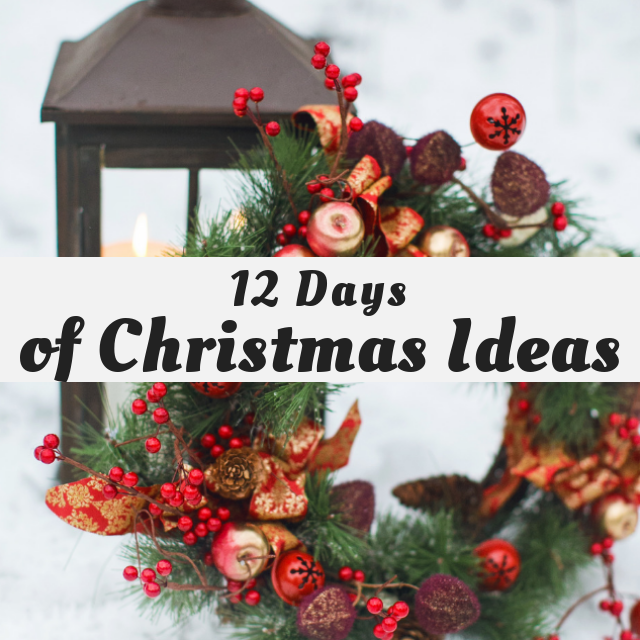 I’ve been busy all weekend getting the post for Day 10 of the 12 Days of Christmas done so it can go live tomorrow morning at 5 am. 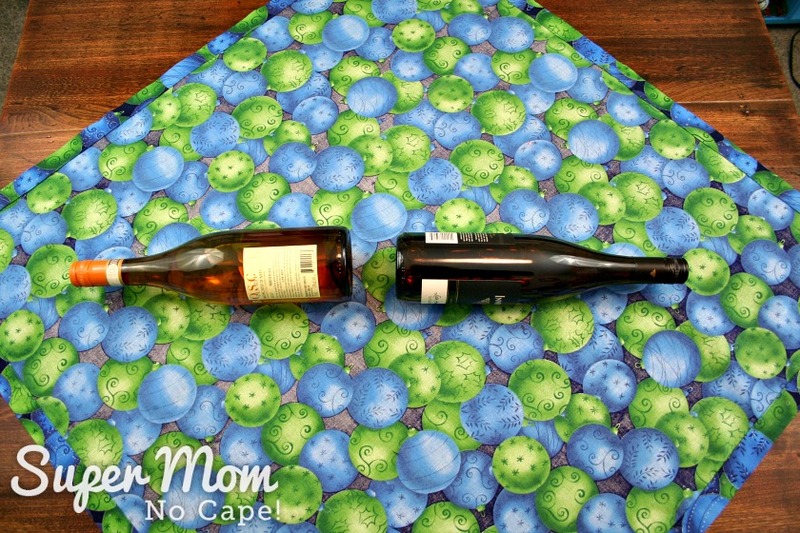 To answer your question… the cloth for the wine bottles was 40″ square. The one for the books was about 36″ square. The one for the box would have been about 33 inches square. I need to add that info to the post. Thanks for asking! These are super elegant packages. The little-boxed one is a gorgeous way to wrap food gifts. Of course, the wine one is handy as well, so much nicer than a boring bag that says, I am a bottle.